Have you ever seen one of these before? 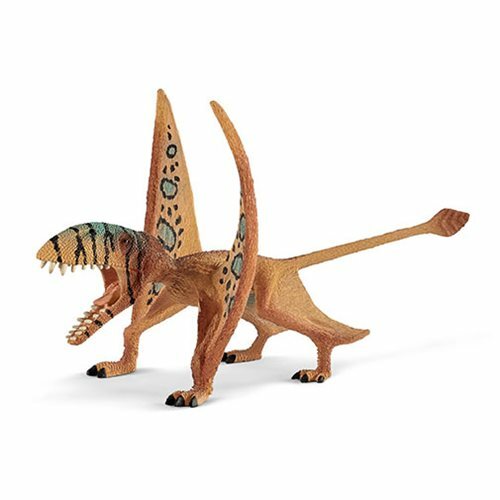 This incredible Schleich Dinosaur Dimorphodon Collectible Figure measures about 6 2/5-inches long x 3 3/4-inches tall and depicts The Dimorphodon, a small flying dinosaur that lived in the early Jurassic Period. The Dimorphodon was a flying dinosaur that measured about 3-feet long and had a wingspan of approximately 4 1/2 feet. Note the large skull and a long beak. It hunted fish, insects, lizards, and other vertebrates, which it held with its claws and then ripped apart with its fangs. With its short wings it could probably only fly short distances, e.g., from tree to tree.